This is why I can't go more than 6months-1 yr without traveling somewhere far away from NYC. 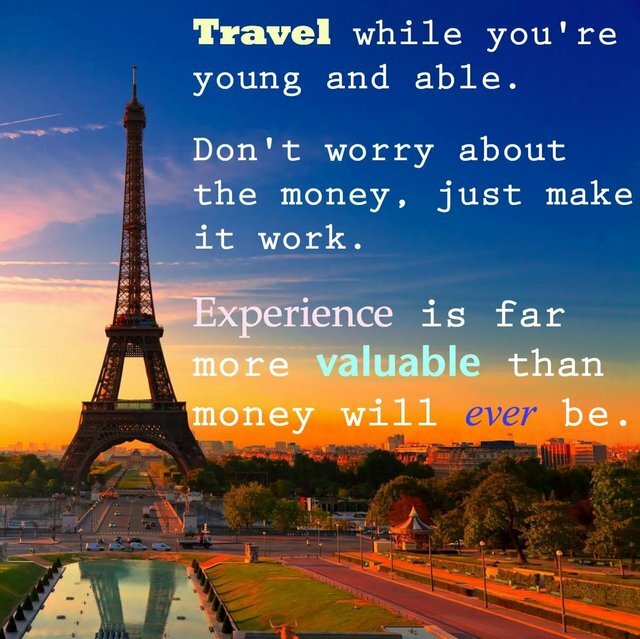 I'll always love my home in NY but just knowing that there's so much to see and experience in the world, and that I'm not getting any younger lol, the travel bug has been biting for years. Ever since the 21-day, 13 country tour of Europe after college, I was hooked. For some, travel may be some mundane, commonplace thing, like for work. I understand it can get boring or stressing, going from airport to airport. And I get those feeling too while traveling, but then it kind of all melts away, as I take in the new surroundings,experience the food, culture, history...These kinds of experiences sing to my soul. We like that quote :-) & we are on the same page. Most people will be 30-something before they get to earn some reasonable money, but than they need to start thinking about setting up the family and so on. First loans, some mortgage and you are tight up for life. Modern slavery. However, I disagree with those who travel to "find themselves". Yes it can give you some perspective, but to find your purpose you need to looking inwards, not outwards. I totally agree! Finding your purpose is an internal journey, and these experiences have definitely given me some insight into what I want out of life. Thanks for the comment!